I had a lot of fun making birthday gifts for my Mum-In-Law and my Sis-In-Law who both share the birth month of February. As you may recall, I was introduced to the wonderful art of tatting last August. So they both received two sets of earrings and complimentary necklaces. Since they have both been able to open their gifts, I can now post this. Enjoy the pictures! I keep seeing cute jewelry photos with earrings hanging off of coffee mugs or tea cups. I think the earring placement made my mug look like a fancy owl face. 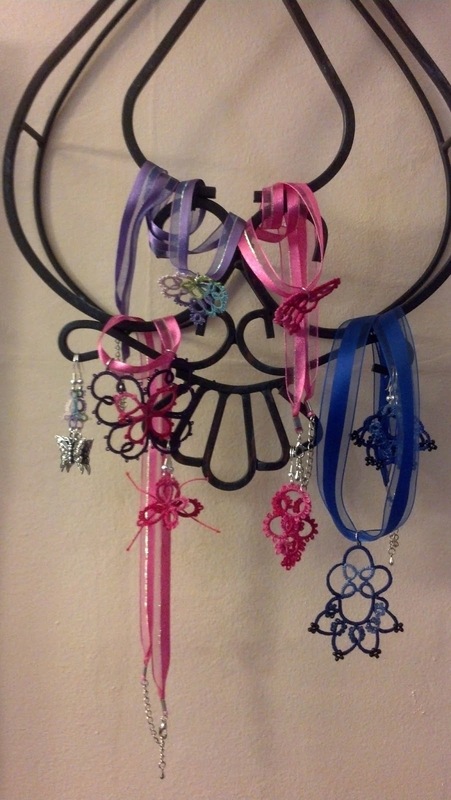 The mug was a bit distracting to me – so my clock won out as the place to hang the jewelry for photos. I love the simple little butterfly. 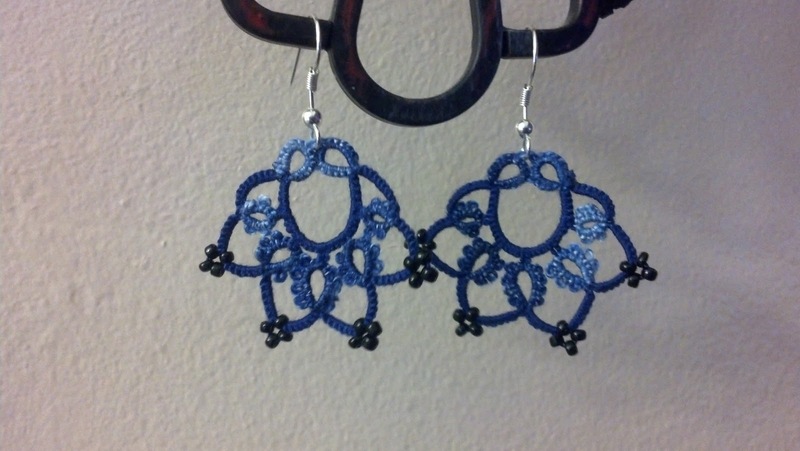 This was the first time I used seed beads with my tatting. I really like how they turned out. Jewelry waiting on the clock (and out of reach of my kitty) to be packaged and shipped to my family. The small butterflies are from Barbara Foster’s Butterfly pattern which can be found in the Handy Hands (http://www.hhtatting.com/) catalog. The larger butterfly is from the diagram found here: http://puntoypunto.myblog.it/archive/2012/04/25/schemi-a-chiacchierino.html It is the second butterfly I have made from this pattern. The hearts are from my Accidental Heart pattern. You can see the pattern and story behind it here. Those are the ones I used patterns to make. Now onto the pieces that I did not have patterns for. I’ve been challenging my understanding of how tatted pieces are put together by tatting from pictures. When tatting from pictures I tend to leave off or add bits at whim. So the blue pendant was tatted from a picture of Gosia’s Little Black Lace Earrings (http://littleblacklace.com/2012/05/14/black-royal-lace-earrings/). This was my first time using seed beads in a tatted piece (I had used a few larger beads prior). 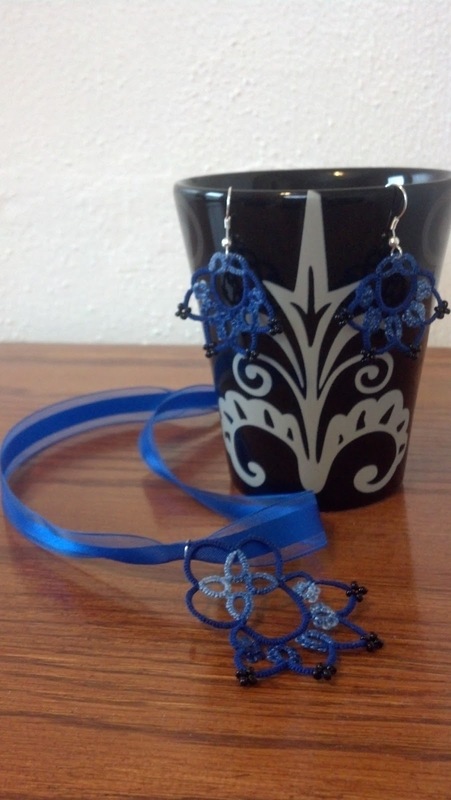 The blue earrings were a simplified version of the pendant. The pink swirl earrings were tatted from a picture of Swirl Earrings by Julie Strier (http://www.etsy.com/listing/114008536/pink-green-purple-variegated-tatted). 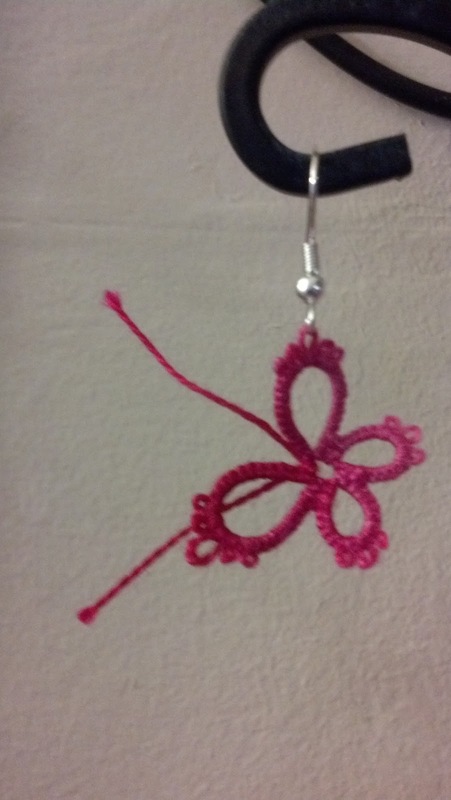 Lastly, the butterfly pendant earrings were a simple design involving split rings and a clover that I arrived at playing with the leftover thread in one of my shuttles. That about sums up my most recent tatting adventures. Thanks for reading!